Are you wondering how to make money with affiliate marketing? So, let’s cut to the chase. 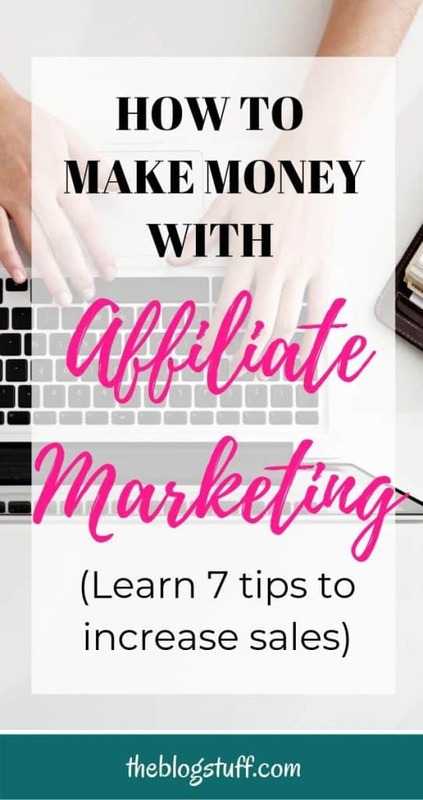 I’m sharing 7 affiliate marketing tips for startups to earn more money with affiliate marketing and make a passive income online. How much and how fast can you make money with affiliate marketing depends entirely on the effort you put to make it happen. No magic here. # Please note that this post contains affiliate links. It means that if you buy through my link I will receive a small compensation at no extra cost to you. I only recommended products that I use and love. Read the disclosure policy to find more about it. In a nutshell, it involves you promoting products with or without a website for a commission. But to make the most of affiliate programs you must understand how to do it properly. Affiliate marketing has been around since the late 1990’s, and it’s still with us for a reason – it works! On this article I will focus on affiliate marketing with a website. Below you will find few tips I use myself to maximize affiliate earnings. Before getting into affiliate marketing, you need to decide on a business model. Will you create a resource site full of instructional articles and posts? Or will you review products and give your recommendation? After settling on a model, you can choose a niche based on your knowledge, experience, or passion. You could also go after a niche that you know makes money even if you don’t know much about it. Just research and learn all you can about the subject. Or if you have have a healthy budget you could pay someone to write your articles. Then, select the products you’ll be promoting as well as the affiliates with whom you’ll be working. Finally, create a website or blog and drive traffic to the affiliate program using powerful content and strong keywords. 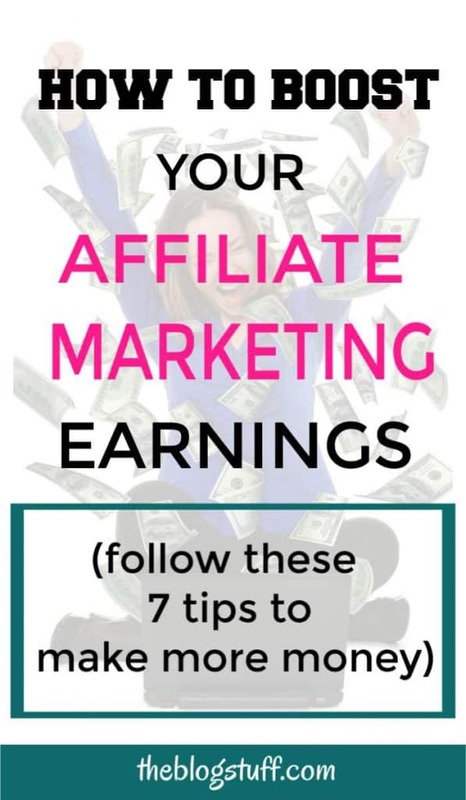 Now let’s have a look at these affiliate marketing tips and strategies that can help increase your sales and your earnings. Are you a beginner looking for affiliate programs to join? Check the best affiliate programs for beginners. How can I maximize my affiliate marketing sales? I have some affiliate marketing tips and techniques that I use myself to increase conversions. You can start by implementing one or two and see how they work for you. Where you place affiliate links is important as it determines how many clicks it’ll generate. This could be in an advertisement, email, website, blog, online forum, or social media post. # Let’s start with affiliate ads. In the past, the most popular and effective spot for a link was first in banners and then in pop-ups. However, these ads were intrusive and annoying, so they soon became unpopular and, thus, ineffective. In response, search engines began to penalize any site or blog with large, flashing advertising. So do ads still have a place in your affiliate marketing strategy? Yes, they do, especially if they’re in sidebar banners. 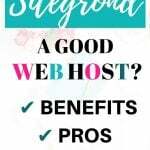 Because each ad measures only 125 by 125 pixels, sidebars take up little space, meaning you can have as many as four non-intrusive ads on your blog or website. And unlike with private advertising, you need no one’s permission for sidebar ads. You only need a link and some graphics, which the affiliate companies readily provide. # Affiliate links also work well when placed in another traditional yet effective form of marketing – emails. As the cheapest form of advertising, emails let you target a specific audience repeatedly. To hand you their email addresses, subscribers need an incentive usually in the form of freebies. And to keep them on your subscribers’ list, your emails must have useful content, not just a sales pitch. Think about how your email/newsletter is going to benefit your subscribers. Make it not only good but excellent. # Some companies like Amazon don’t allow direct linking on emails. Make sure you read the company rules to comply with them. # Speaking of useful content, the most effective spot for links is in any text link embedded into your content. This could be your website, blog, online forum, or social media content. To increase your chances of your audience clicking on a link you must make sure that your content is helpful and relevant to them. 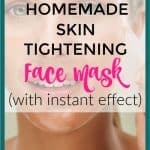 When writing a blog post recommend products that you have tried yourself or you know they are good. I find that I have more success when I place links at the beginning of a post (above the fold), within the content and at the bottom, just after your article ends. Sidebars never do good for me but you need to experiment to discover what works best on your blog/site. # Guest Posting – When writing in a high-traffic blog as a guest, the rules differ slightly. Although any links you embed in your article allow you to tap into the blog’s audience, don’t be aggressive in your marketing. The blog may decline to publish your article. Instead of focusing on money, focus on creating useful content but with subtle links. 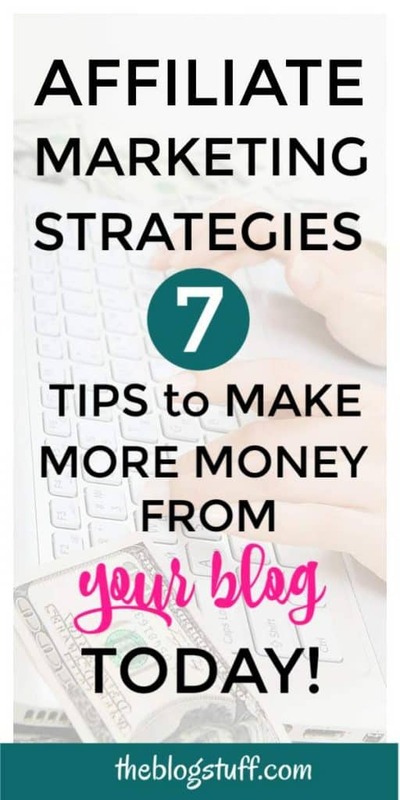 Many blogs won’t allow you to post affiliate links but take this opportunity to write a helpful post related to an affiliate product you are promoting and link to that article. # Social Media – The same applies to social media. Keep your tweets or posts simple, your audience interested, and your affiliates relevant. And again, don’t go overboard in your advertising. Rather than posting direct affiliate links I prefer to link to an article where I have placed strategic links to products I’m promoting. My favorite social platform to make money as an affiliate is Pinterest followed by Facebook and Twitter. # Forums – About online forums, they present the greatest challenge when it comes to embedding affiliate links, and here’s why. Members regard anyone, especially a new member, who posts a link to a product or service as only there to profit, not to contribute. However, a longtime, regular contributor who has gained everyone’s trust won’t arouse any suspicion, so become one before posting any links. Personally I never post links on forums or blog comments. It looks spammy and it can get you banned. Another way to increase your affiliate earnings is by focusing on what really matters to your customers/readers. But what exactly do you focus on? The answer is simple – the benefits of a product. Many novice affiliate marketers focus on the features instead, but they soon learn that features don’t sell because customers care less about them. Instead, people care about how a product can help them and change their lives for the better. So when writing about a new diet, for instance, talk more about how it helps people to lose weight and live healthy lives than you do about its ingredients. Get into the mindset of someone who is ready to buy what you are promoting and think of the keywords they will type on a search engine. Buyer keywords are key to increase conversions because they are almost “there” in the buying process. You just need to take them by the hand and lead them to your affiliate links. You can also target long tail keywords that are very specific to what you want to sell. Just make sure that they have a reasonable volume search and are not very competitive. Imagine that you are promoting a specific product or service you really want people to look at and ultimately buy it. Keep your visitors focused by getting rid of all the things on your post that can distract them from the action you want them to take. For instance to improve conversions try removing ads, other non related affiliate offers, sidebar widgets, banners or even related posts. Check if removing these distractions help your readers to focus on the product you are promoting and the actions you want them to take. Since you want to create trust you need to provide your readers with targeted free content. You don’t need to add links to every single paragraph. Just be helpful and write articles with solutions to your reader’s problems. Popular types of post you can write include tutorials, reviews, comparison, guides, tips and lists. To increase trust it is also important to have an about me page that tells readers a little bit about you and how you can help them. Don’t forget to upload a picture of yourself. I like to see who is talking to me. Do you? As an affiliate marketer, you want visitors to do more than read your website, blog, forum, or social media content. You want them to buy a service or product, click on a link, fill out a form, share your content, call you, or give you their email address. In short, you want to convert them into customers. But for this conversion to happen, you must urge them to act before they leave. You need a call-to-action (CTA). Using urgent language and captivating graphics, the CTA gets you the sale you so need. However, crafting a powerful one takes careful planning and positioning. Your call to action can be a clickable button that, most importantly, looks clickable. To achieve this visual effect, create one simple, round or rectangular button with a distinct border and white space around it. Also, its color must contrast with that of the background if it’s to stand out. Make the button text clear, concise and legible, besides urging people to act now. So choose your words and fonts wisely. You could also add an incentive to the CTA, such as a discount, free eBook, download, or trial period. Look for places on your site where the CTA is more visible. Above the fold and again at the end of your post are good spots. Another way to place a call to action is within your text. Make it stand out by enlarging the text or highlighting the background in a striking color. Tell your readers what action to take by pointing out a benefit. For instance you could say something like “Download this complete SEO guide NOW and learn your way to better rankings”. Be creative and keep testing new CTA. Make sure your call to action is the last thing your visitor sees and clicks on before they move on. How do you increase affiliate sales? You could increase your affiliate conversion rate if you try different tactics. 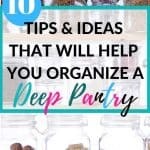 Make a resources page – To make the most of the affiliate links and tools you use on your blog list them in a resources page. 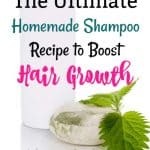 Talk about the benefits of your recommended products and how they help you. Don’t over-exaggerate, just be truthful. Mix your affiliate offers – Mix informational articles with product reviews or even direct link to some affiliate offers. Mix and match and see what type of affiliate links work best on your blog. Create a video – You could make your own video giving more details about the products you are promoting. If you really want to increase your monthly income join these High Paying Affiliate Programs. If you are a new affiliate you might wonder how long does it take to be a successful affiliate marketer. And there is not straight answer. Few affiliates are able to make a sale in the first few days but is not your average result. The majority have to keep working at it until they see consistent results. Learn the tactics, focus on getting targeted traffic to your blog, implement what you have learned and be consistent in producing helpful content; you know? The one people can relate to. And keep testing old and new techniques, one at a time. Although it might seem confusing at first, it isn’t that difficult when done properly. The important thing is to know where to place affiliate links and how to frame your content. If you are aiming for long term success you need to work hard from the beginning. Create content readers need and want to read. Don’t just deliver but over-deliver. At the end of the day is better to have 10 awesome pieces of content than 50 pages no one cares about. To sell more, trust is essential, but this is something you can build upon. Trust will come with time but only if you put your audience needs before your profit. Lastly we are legally required by the FTC (Federal Trade Commission) to disclose affiliate links. Most bloggers add theirs at the top of the post or somewhere above the fold. It needs to be clear and state that you might receive a commission if they make a purchase through your link at no extra cost to them (or something similar). 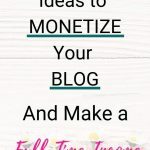 # Affiliate Marketing for Bloggers by Carly Campbell – If you really want to learn how to make money with affiliate marketing check Carly’s guide. A complete course to increase your affiliate sales from someone who’s “been there and done that”. # Traffic Transformation Free Trial Guide by Lena Gott – If you don’t have enough traffic to your blog/site subscribe to Lena’s free trial guide to increase your visitors and hence your income. She does exactly what she preaches, so you are in safe hands. Do you have affiliate marketing tips worth sharing? What’s your top tip?